When done well, sampling is an artform. That really can’t be disputed. The process of a producer digging for that right sample or loop and then applying their own creative stamp to create something brand new involves time, passion and talent. Legendary beat scientists such as the late Paul C, Public Enemy’s mighty Bomb Squad and live-guy-with-glasses Large Professor have all proven how just a few seconds of music lifted from an obscure (or in some cases, not so obscure) piece of vinyl can be transformed into a shining example of pure Hip-Hop gold. Carrying on that tradition of dusty-fingered alchemy, NY’s Ayatollah and California’s Drasar Monumental have joined forces once again for the third installment of their “Box Cutter Brothers” series. With Ayatollah’s lengthy production credits including work with the likes of Mos Def, Cormega, Masta Ace etc, and Drasar having been MF Grimm’s producer of choice in recent years for his “Good Morning Vietnam” projects, it’s safe to say this pair know more than a thing or two about crafting quality beats. Split into two halves, with the duo rocking six tracks each, “Box Cutter Brothers III” follows in the footsteps of its two predecessors by capturing a variety of moods, from the rugged to the smooth, through the selection of well-chosen samples that are chopped, sliced and spliced throughout. Monumental kicks off proceedings with the dramatically-titled “Apex Predator Blades”, which finds the West Coast resident dropping a brief, assured verse complete with claims of being a “third degree black-belt” in breaks over a funky, keyboard-driven groove, before the track builds into something that sounds like an ominous boom-bap remake of a cut off the original “Terminator” soundtrack. “The Fine Art Of Survival”, meanwhile, offers a cool summer breeze vibe, with Drasar chopping-up a lush, sped-up soul sample which is both hypnotic and infectious, whilst “Black Calculus 2” is a more melancholy affair, based around sombre pianos and subtle-yet-persistent drums. Following the example set by his musical comrade, Ayatollah also rhymes on his opening track, with the organ-laced “Graffiti” conjuring up images of 80s NY subway trains adorned with multi-coloured burners (“Up in the Bronx, I’ll meet you at the Writer’s Bench, Hop the turnstile, No token needed…”). “The Best That I’ve Got” brings a mellow, back-to-the-future flavour to the table, with the track’s sweet, retro vocal sample being matched with thick, electro-style keyboards, a combination which is followed by the raw beats and manic piano stabs of the MC Shan-sampling “These Brothers”. 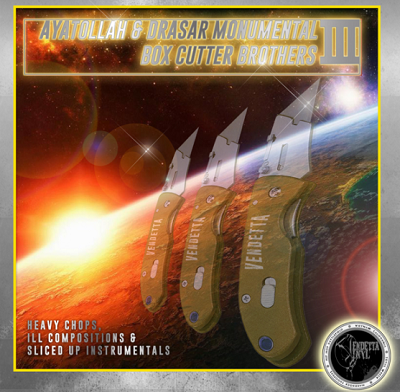 True masters of their craft, Ayatollah and Drasar Monumental have succeeded in creating another bi-coastal display of impressive sonic showmanship, with “Box Cutter Brothers III” proving once again that a dedicated crate-digger will never stop looking for that perfect beat. “Box Cutter Brothers III” drops on October 12th via Vendetta Vinyl and BandCamp – props to Drasar Monumental for hooking me up early with the project.